The Oaxans sent a contingent over Semana Santa (Easter Week) to display their eye-popping culture via their amazing cuisine and crafts. I returned over and over to feast on Oaxacan classic delicacies like tender black mole tamales wrapped in banana leaves and Tlayudas. Tlayudas are unique to Oaxaca, where so much of what you eat is truly unique. Women make (or rather hand craft) super thin, crispy corn tortillas to be slathered with layers of flavor starting with asientos, the sediment from the bottom of the pot when pork carnitas are boiled in their own fat until juicy/crisp — asientos is like bacon flavor concentrate! Piling it on, they continue with black beans, Oaxacan string cheese, maybe three meats including the wonderful little vinegary sausages you find in Oaxacan marketplaces. Add a little homemade salsa and voila! Mexican pizza. 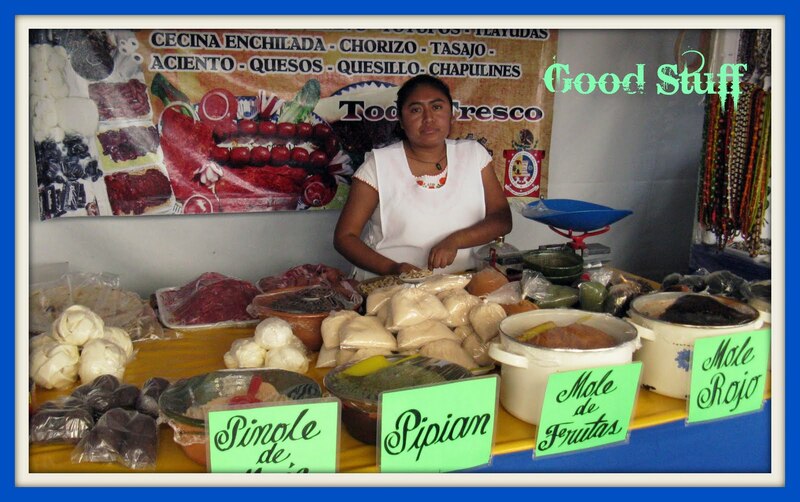 The young lady in the picture above was happy to list the ingredients — up to 20 in some of the mole pastes she is selling — and instructions for preparation. Nothing was written down. The Oaxacans, like so many true artists, are not salespeople. They wait patiently, if not shyly, for the buyer to make up his or her mind. A true soft sell. I would like to encourage everyone who is interested in Mexican culture and cuisine to visit Oaxaca. Pay no mind to negative PR about how dangerous it is with political rioting etc. True, Oaxaca has serious political issues, but they do not affect the tourist, and I have never at any moment felt unsafe in Oaxaca. Taking basic precautions, like not wandering in dark alleys at night… you’ll find Oaxaca an amazingly rich mine of Mexican history and culture — and of course, FOOD!